DENVER, CO / ACCESSWIRE / July 9, 2015 / MassRoots (OTCQB: MSRT), one of the largest and most active communities of cannabis consumers, is pleased to announce it has grown to 420,000 users. The Company believes it is the largest social cannabis app and that there are roughly 10 million cannabis consumers in America who actively engage on social media, its immediate addressable market. 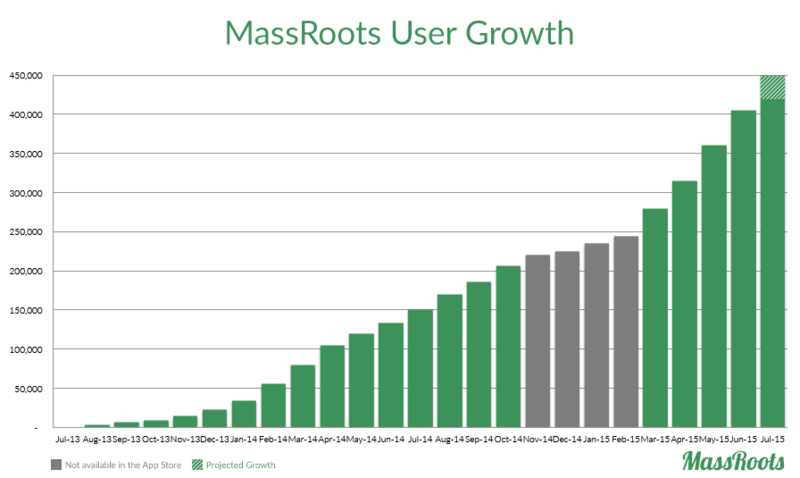 "MassRoots' growth continues to exceed both our internal and external goals, putting us on a clear path to 1 million users by early 2016," stated CEO Isaac Dietrich. "We expect to begin monetizing our userbase later this summer and much like our user growth, we believe we will deliver consistent and sustainable monthly revenue growth." MassRoots is expected to release its Q2 earnings report and host a shareholder conference call after market close on July 21, 2015. For more information, please see the Company's July 6, 2015 release. MassRoots is one of the largest and most active communities of cannabis consumers with 420,000 users. It is proud to be affiliated with the leading organizations in the cannabis industry, including the ArcView Group and National Cannabis Industry Association. MassRoots has been covered by CNN, Fox Business, CNBC, Fortune, BBC, Cannabist and the New York Times. For more information, please visit Corporate.MassRoots.com. This information does not constitute an offer to sell or a solicitation of an offer to buy securities or assets of MassRoots. All information presented herein with respect to the existing business and the historical operating results of MassRoots and estimates and projections as to future operations, potential partnerships with other businesses, the success of events that we are attending, and other information, is based on materials prepared by the management of MassRoots and involve significant elements of subjective judgment and analysis which may or may not be correct. While the information provided herein is believed to be accurate and reliable, MassRoots makes no representations or warranties, expressed or implied, as to the accuracy or completeness of such information. In furnishing this information, MassRoots reserves the right to amend or replace some or all of the information herein at any time and undertakes no obligation to provide the recipient with access to any additional information. Nothing contained herein is or should be relied upon as a promise or representation as to the future. Certain matters discussed in this announcement contain statements, estimates and projections about the growth of MassRoots' advertising business, potential partnerships with Flowhub, success of investor events attended by the Company,and our related business strategy. Such statements, estimates and projections may constitute forward-looking statements within the meaning of the federal securities laws. Important factors that could cause our actual results to differ materially from those anticipated by the statements made herein include, among others, the success of our advertising initiatives, the continued growth and engagement of our user base, our ability to work with partners of the Company, and unforeseen technical or other problems or issues that could affect the performance of our products or our business. Further information on our risk factors is contained in our filings with the SEC, including our Registration Statement on Form S-1 filed with the SEC on August 26, 2014. Factors or events that could cause our actual results to differ may emerge from time to time, and it is not possible for us to predict all of them. Any forward-looking statement made by us herein speaks only as of the date on which it is made. MassRoots undertakes no obligation to publicly update or revise any forward-looking statements, whether as a result of new information, future events or otherwise. The recipient of this information is cautioned not to place undue reliance on forward-looking statements.